Welcome to the Text Mode Demo Contest 20 site. TMDC is a pseudo-annual demo-making contest held over the internet. After tAAt ry announced they would stop organizing TMDC after the 10th edition, members of the Northern Dragons offered themselves to keep TMDC alive. Text mode demos offer unique challenges for the demo maker which play a very insignificant role in other kinds of demo competitions. First of all, resolution and color spaces are rather limited, forcing the demo authors to consider different forms of anti-aliasing and careful adjustment of contrast and color balance. Additionally the demo authors will not have the usual hardware-assisted rendering, forcing them to create their own rasterization methods, while giving them a huge amount of CPU power per pixel. Things like per-pixel real-time raytracing are a realistic choice in text mode demos. Can you make textmode look good? january 18th, 2018 Results, at last! A few more demos than the norm, and a VERY tight top 3. Well known faces, but also newcomers, that, sadly, didn't read (or folow) the rules. I hope you all like. It's been fun to watch! Have a look at the results, but more importantly, at the prods! And don't hesitate to discuss in the official thread too! november 26st, 2017 Fashionably late? Well, maybe not, but at least it's out there: the invite! Download it, watch it, get inspired, tell your friends, and make a demo about it! Seriously, there's still plenty of time to make something decent! If you don't know where to start, have a look at the download page for templates and libs. October 21st, 2017 TMDC, one more time! In an attempt to be less late than usual (and maybe get more entries), we're not waiting the 11.11 to announce that we'll celebrate your text mode demo art again this year! Same rules, same deadline, same goal: make it look good! An invite will be released, but don't wait for it, start working on your prods NOW! And because it's official, there's also an official pouet thread in case you have questions or want to discuss any aspect of this online competition. January 17th, 2017 Results? Results! The official results are now out and uploaded! November 11th, 2016 It's TMDC time, again! I'm finally taking some time to update this site, and rightfully so! It's official, TMDC is back for a 19th edition!! And to make it even more official, there's even an invitation demo! Go get it, watch it, get inspired, and make something great! You can submit your demo anytime between the 11th of November to the 12th of December. The rules haven't changed. We, mostly, just want you to make textmode look good! And have fun doing so! It's with great pleasure that I'm writing these lines. The jury has voted, it was compiled and the results are out! We're seeing new people this year, with refreshing approaches. you guys are keeping textmode alive! If you want to watch or rewatch some of the entries, jump here and have a treat! October 22th, 2015 It's TMDC time! This week-end at TRSAC was released a demo. A textmode demo. How comes? 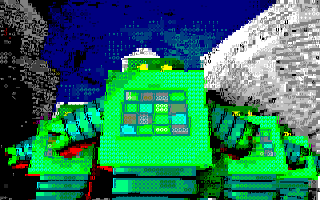 Well, it's to tell you, no, invite you to take part in the 18th Text Mode Demo Challenge! You can submit your demo anytime between the 11th of November to the 12th of December. The rules haven't changed either. We, mostly, just want you to make textmode look good! It's with great pleasure that I'm writing these lines. The jury has voted, it was compiled and the results are out! The battle for the 1st place was extremely tight! There were very few entries but big props to those who contributed: it's high-quality demo art! If you want to watch or rewatch some of the entries, jump here and have a treat! November 9th, 2014 The invite is out! It was released yesterday at Kindergarden. We're showing our love of ASCII with an invite! Grab it, watch it, get inspired, spread the word! 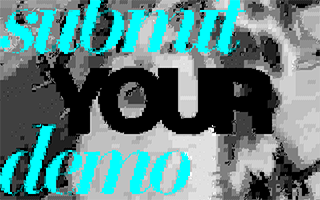 October 27th, 2014 We Want Your Demos! TMDC is back! This year again, we want your best ASCII demos! And in other news, mu6k of Brainstorm recently released his Text Mode Framework. Not only does the demo look good, but, as the name implies, it comes with full sources! Ain't it great! Combine that with Sol's textgl and text fx, and with Moerder's FTW7, or Fragment's equivalent, now there really is no reason not to do something! TMDC16 is over. This year we had few prods, but some were insane! Congratz to the winners, and big thanks to all contestants, members of the jury, and the fans. You are keeping textmode alive! November 12th, 2013 Yes we're back! Looks like the site doesn't update by itself. At least it doesn't post news by itself. So, while it's already been announced everywhere else already, I'm finally posting here that yes, like you all knew and/or expected, TMDC's back! The invite is on pouet, and the offical thread too. No major change this year. Still the same rules, still the same dates, still the same goal: make it look good! Thanks to all participants, it was once again a pretty nice TMDC! I personally am glad to see we've got more entries in 2012 than 2011. Even if it was the end of the world, textmode isn't dead yet! November 21th, 2012 Prize update! In addition to that we will have the famous diplomas, some ND stickers and maybe other random stuff. November 11th, 2012 Rule change, invite released and submissions open! As discussed in the official Pouet thread, we're upping te package limit from 7.3 MB to 32 Mb. In other news, the invitation was presented at Kindergarden this weekend, and can finally be realeased to the grand public. Also, what date are we today? That's right! We're the day the submission period starts! Go get your demo done, add some spit and polish, and get it on our servers! October 30th, 2012 We are back!! In an attempt to be less late than usual (and maybe get more entries), we're not waiting the 11.11 and already announce that all your text mode demo goodness will be celebrated through this year's Text Mode Demo Competition! An invite will soon be released, but don't wait for it, start working on your prods NOW! December 16th, 2011 New submission upload system! We've been recently informed that gmail now blocks file attachment containing executable files. It's not new, but we usually suggested to get around this limitation by using RAR instead of ZIP. But as of now, RARs are blocked as well! Don't fear! We got a solution! Actually some of our recent participant found them. It seems that 7z works (thanks s_tec) and also, just renaming a zip to .z_i_p also works (thanks mu6k). While this is pretty convenient, it probably won't last. So we set up an online submission form (thanks Polaris), on the submission page. That should be pretty straightforward to use, but make sure to contact us if there's any problem. In the advent that you actually sent us something, but haven't heard of us yet, it probably bounced. Please send again using the online uploader or the other methods described above. Thanks. December 1st, 2011 Prize update! The gentle folks at Mindcandy are once again sponsoring us with their DVDs and BluRays. Top 3 winners will have the choice of either MC1, 2 or 3. It means that, if you won an MC3 last year, and you bought an MC1 some time before, then you could want an MC2 to complete your collection. Or you can take another MC3 to give to your mom. As you please. For those who haven't heard of them yet, the Mindcandy DVDs and Blu-Ray feature some of the best demos, recorded in the best conditions possible, so that you can enjoy them without worrying about platforms, settings or other hassle. But above all, the MindCandy series features audio commentaries of those who made those legendary demos, so you can learn about a demo and its authors while watching it. You don't have that on youtube. Also, Ixchels Studios, makers of Wicked Defense and Aztlan dreams, are offering to sponsor us with their upcomming, unnannounced, yet to be published, game. You're likely to be the firsts to play! The other prizes include, you guessed it, the legendary TMDC Diplomas! Uniquely designed and typed by hand (before being machine-printed). November 11th, 2011 Invitation released! October 12th, 2011 TMDC 2.0 ? After 15 years of more or less the same site, I decided to rewrite the good old html to at least use some CSS. So here it is! For those who might wonder, don't worry, this doesn't affect the competition! :) Talking of which, it's still happening this years again. An invite in currently in the making. We're also looking for sponsors. If you're interested, drop us a line! January 11th, 2011 and the winner is?